Crispy outside, creamy inside – these toaster oven baked potato wedges taste better than takeout! 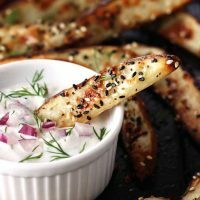 Toss with Everything Bagel seasoning and serve with a tangy yogurt dill dip for the ultimate appetizer or midnight snack. Even with just salt and pepper, they’re addictive. Potato wedges are the perfect cross between a baked potato and french fries. They’re crispy on the outside but creamy and tender inside. So why haven’t we shared this recipe sooner? It’s important to Tim and I that you have the best chance of recreating the same tasty recipe results in your toaster oven as we did in ours. Since we’re home cooks and not trained chefs, that means lots of recipe testing. If we can’t get the same results at least 3 times in a row that recipe doesn’t get posted. Like these crispy potato wedges. We’ve been making them for over a year but every second or third batch some would stick, tearing the wedges and leaving half of the french fry on the pan. More oil just made them soggy. Since we know parchment paper should never go in a toaster oven we tried a silicone baking mat but it kept the wedges from crisping enough. Then, we tried the “soaking in water for an hour and pat dry” technique. It worked great, no sticking. Even though I’ve heard that tip 1,000 times, we have used it exactly once. See, I’m embarrassingly impatient and snappy when hungry hangry. So no amount of “ooh it will taste sooo good” is enough to sell me on waiting an extra hour once I’ve (as my mom says) “set my face” for some roasted potato wedges. And I would never suggest that you, my friend, wait either. We set the recipe aside until we could come up with a good 100% no-sticky-wedges solution. Then, I saw this post from Creme De La Crumb. Instead of laying the potato wedges on their sides, she places them skin-side-down on the baking sheet. First, we tried baking the wedges upright the whole time. But the sides never seemed to get golden and browned, even using the convection function. Then, we started them skin-side-down again but knocked the wedges onto their sides halfway through the cook time. 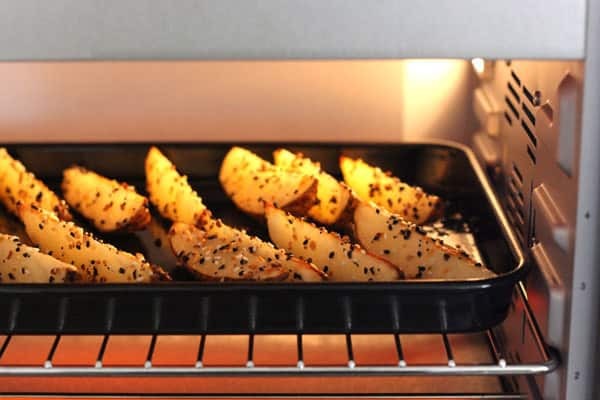 The result…finally we had an unbelievably easy recipe ready to share for perfectly crispy toaster oven baked potato wedges that won’t stick! What About Seasoning And Dip? You can go simple with a few heavy shakes of sea salt and black pepper. If you’ve got a store nearby, Trader Joe’s just came out with an Everything Bagel seasoning blend that was meant for these potato wedges. And what goes better with Everything Bagels than a tangy greek yogurt dip with garlic, fresh dill, and chopped red onion. The combo is fantastic, though it’s garlic breath city. Probably not the best idea before a big job interview or first date. As a late night snack for yourself or with your sweetie, it’s perfect. 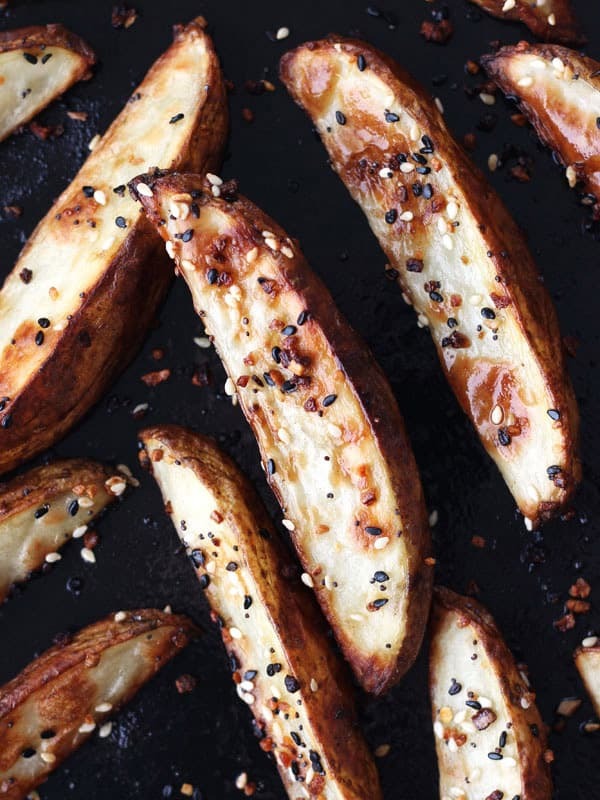 Easy to customize these crispy and creamy baked potato wedges taste better than takeout. Rub 1 teaspoon of the oil over a baking sheet or roasting pan. Place potato wedges in a large bowl and toss with 2 teaspoons oil (use your hands to rub the oil all over and coat well). Add seasoning and toss again. 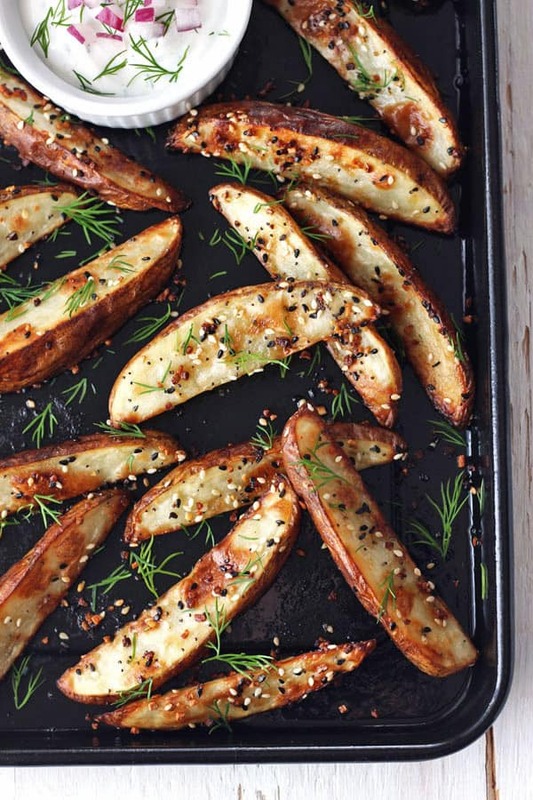 Arrange wedges in a single layer, with skin sides facing down and bake for 15 minutes. After 15 minutes remove pan from the toaster oven and using a fork or tongs to tip each wedge onto its side. Return to toaster oven for another 15 to 20 minutes or until golden and crisped to your liking. 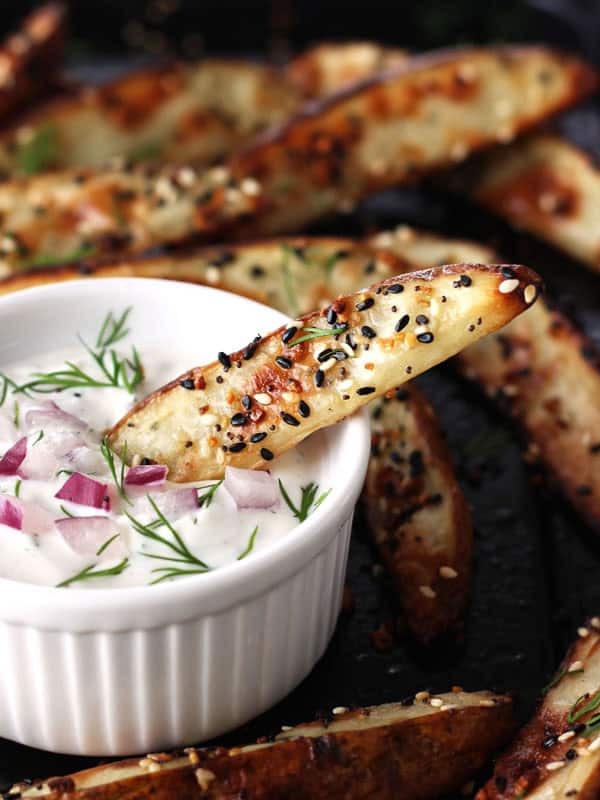 Serve potatoes wedges warm with yogurt dill sauce (recipe below) for dipping. Convection Toaster Ovens: Bake at 375 keeping the wedges upright for 15 minutes then flipping onto sides and cooking an additional 10 minutes or until crispy. 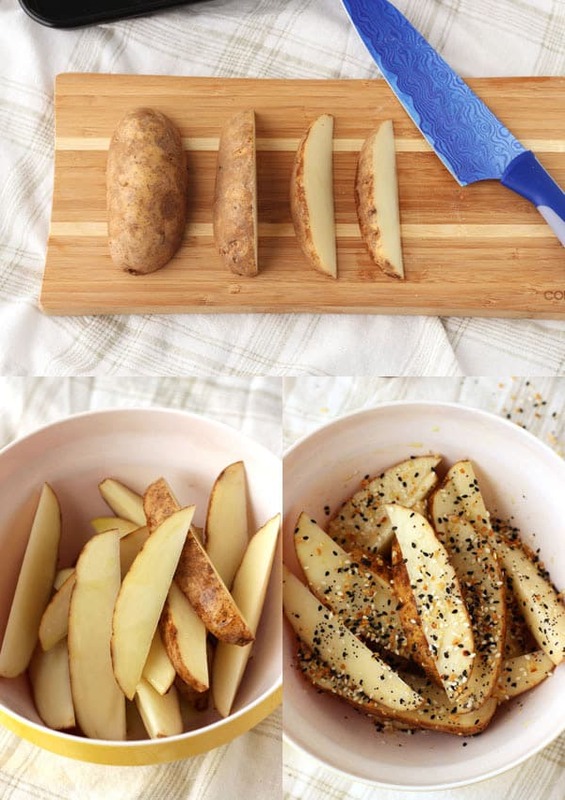 How To Cut The Wedges: Slice potatoes in half lengthwise and then slice each half into quarters. You should have 8 wedges total for each medium and large potato. Cut smaller potatoes into quarters. Nutritional information is an estimate for 1 of 3 servings made with everything bagel seasoning. Don’t have a Trader Joe’s nearby or want to make your own Everything Bagel seasoning blend? We found a recipe on food.com and one on thekitchn.com, both look delicious! A tangy yogurt dip with garlic and fresh dill perfect. Serve with warm toaster oven baked potato wedges. Nutritional Information is an estimate for 1 of 3 servings of dip. You can substitute 2 teaspoons dried dill for the fresh dill. First time cooking potato wedges and i followed every step…sooo good! my toddler went crazy on them also so i had to make seconds! thank you! 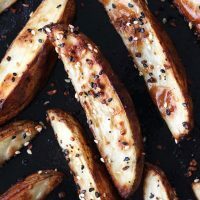 I make oven baked potato wedges almost every week, but never sprinkled them with seeds, such a great idea.! I will make these for sure. Thanks, Adina I think you will love the flavor combo especially with your sweet chili wedges, those were so good! perfect spice blend! i’ve never applied that combination to potatoes, but it’s a must-try! Great idea! Thanks for taking all of the time testing so we can enjoy your discoveries and have a success the first time! Aww, thanks mom 😉 Can’t wait to hear how they turn out with your Cuisinart!